Not to be confused with Tweeter. A Tweester in Paper Mario. Tweesters are tornado-like enemies found in the Mario franchise that try to touch the player, sending them into the air in an attempt to redirect their movements and hinder their progression. In all of the games, they cannot harm the player directly and can only attempt to force them into a more dangerous situation. They are usually found in desert levels. Tweesters debut in Paper Mario, where they forcefully blow Mario one screen to the north and one screen to the east in Dry Dry Desert if he comes into contact with them. It is typically a poor choice to touch them, as the player can easily get lost within the vast sands. However, one particular Tweester (in an area with blue cacti) can be used to throw Mario next to an elevated Badge on top of a high rock which cannot be reached by any other means. 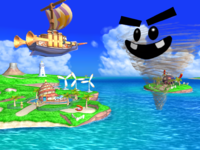 In Mario Party 5, a Tweester creates the tornado from the minigame Twist 'n' Out. In Mario Party 5, Mario Party 6, and Mario Party 7, an orb called the Tweester Orb appears, being based on them in appearance and function. In Dance Dance Revolution: Mario Mix, a Tweester attacks the SS Brass, making it spin out of control. This Tweester appears on an island and is not situated in the desert as most are. Tsumuji Kun From tsumujikaze (つむじかぜ), the word for whirlwind, and the Japanese honorific kun. German Tornadino Derived from "tornado"
Avalanche! • Banana Storm • Block Treasure • Chain-Chomp Chase • Coin Collection • Fire Up the SS Brass • Flagpole Leap • Hidden Treasure • Note Pickup • Punch Up • Whack-a-Goomba • Whee! This page was last edited on April 19, 2019, at 20:52.